Your path to greater copywriting success begins right here, right now! Writing compelling copy centers around making a connection with the reader. In today's multi-media assault on the senses, it's harder than ever to compete for attention and cut through the clutter to get your message heard. Readers don't have time to search for hidden benefits or slog through bloated prose that doesn't get to the point. As a copywriter, your job is to grab them, hold their attention and convince them to take action, all within a few paragraphs (or sentences, for that matter!). Have you ever read copy that bored you senseless or made you think, "no one really talks like that", or left you wondering why on earth the writer buried the benefits at the end of their spiel? 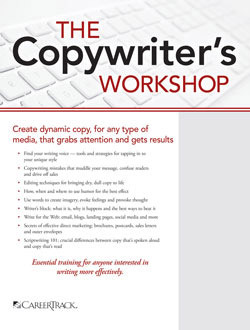 The Copywriter's Workshop will show you how to create copy that's brilliant, persuasive and accessible to your audience. You'll learn to weed through your prose in search of flabby, ineffective writing and replace it with strong, direct wording that gets to the point and holds reader interest. You'll see exactly how to craft hard-hitting, benefit-laden copy that sets up a great offer and delivers exactly what you've promised. Whether you're a seasoned copy pro in need of fresh ideas and new directions, novice writer eager to gain tips, tools and pointers or a professional in any capacity looking to expand your writing skills, this course is one you positively should not miss. Mark the date, clear your calendar and get ready to begin writing more powerfully and persuasively than you ever thought possible! Master these little-known features of Microsoft® Word — they will have you writing better in minutes! Copywriting red flags to avoid — they will send your readers running every time! Your Audience — Who Are You Writing to? Who is your audience? What are their interests? Desires? What actions do you want them to take? The deadly sins of copywriting: which have you recently committed? Get to know your audience — writing to "the one"
The Art of Illogical Thought: Creativity Begins Here! 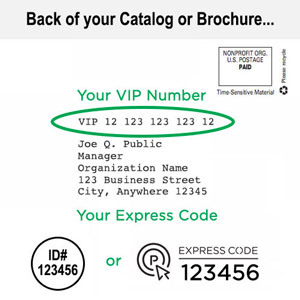 Out of the box thinking — how to train your brain to get "out there"
Standard formatting templates for common projects including brochures, sell sheets, press releases, letters, Web pages, etc. Tips for moving between media: brochures, letters, scripts, TV, radio, press releases, etc. The New York Times vs. Sullivan: how this landmark decision affected "freedom of the press"
Are parodies legal or illegal? Legal or illegal: can you tell the difference?